More information: New edition of album now including 4 bonus live tracks. 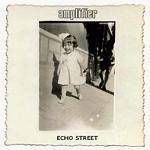 Amplifier is an English rock band originating from Manchester. The band has released five albums and four EPs since its inception in 1999. Their music has been described as "Soundgarden, Tool, Black Sabbath, Oceansize and Pink Floyd taking copious amounts of mind-altering substances and venturing on a trip through time and space (to another dimension), and back again.Their music is characterised by guitarist Sel Balamir's effect pedals, Matt Brobin's complex drumming, extended heavy sections, atmospheric compositions and philosophical lyrics. Their fourth album Echo Street was released in March 2013. The band stated that they recorded the album in sixty days. It is also their first effort under their new record label, Kscope and the first one to chart, peaking at number 90 on the German Albums Chart.